The Inns of Court & City Yeomanry Yacht Squadron was informally founded in 1985 to foster interest in sailing among members of the Regiment. 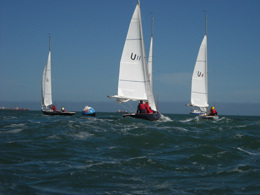 Several members with yachts had hosted crews for Royal Armoured Corps Yacht Club rallies and in 1986 a team entered for the RAC Regatta at Seaview won the Yeomanry Trophy donated by Colonel Digby Thompson. This success was repeated for the next two years, following which a team was entered in the Royal Signals' Regatta for several years. The Yacht Squadron grew in stature in 1991 when, following a Christmas dinner suggestion by Major Richard Gentry, it started its own annual Devil's Own Invitation Regatta attracting all Corps, Arms and Regimental teams and others of a military nature. The Regatta is normally held at Seaview on the Isle of Wight on the Friday of the first May Bank Holiday weekend, and teams compete for the Carden Decanter (presented by Colonel Stephen Carden) and the Rusty Shackle. Dinners are held at the Regatta and at the Royal Thames Yacht Club in Knightsbridge during the winter.